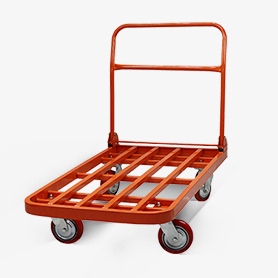 Our Heavy Duty Trolleys allow for ergonomic & safe handling of goods. Super handy and robust with big 200kg lifting capacity and tested to CE, TUV and GS European Standards. Ideal for distribution and sorting operations. Features a foldaway handle for easy storage or transport. Solid wheels with quality bearing ensure a smooth ride. We guarantee our Heavy Duty Pallet Trolleys with a 12 month warranty.